The bid price of Keywords in your industry or niche. Whether you use Negative Keywords, Geo Targeting and Ad Scheduling. It's a common debate throughout the PPC world. Read on to see the full explanation or get our free guide to lowering your PPC costs. This feels a lot like the old saying "How long is a piece of string? ", but answering "How much does AdWords cost?" depends on a multitude of factors such as: your industry, your daily budget, which network you want to operate on and even your end goals. AdWords is a series of fine tunings and unpredictable spend. The UK average cost-per-click of Google AdWords, on the Search Network, is between £0.66 and £1.32. 1. The bid price of Keywords in your industry or niche. Something many inbound marketing agencies, such as ourselves, cannot stress enough, is that the niche you're in will determine the value for money you’re most likely going to achieve. Unfair? Yes, but that’s just the nature of AdWords. For example, if you’re one of the unlucky PPC souls to work within the Gambling industry, AdWords may not be worth it for you. With keywords costing in excess of £122.87 per click (yes you heard that right, per click) for the keyword “live blackjack”, it may put you slightly out of pocket to get those 6 people around the table. Very high suggested bids in the Gambling industry. But don’t let me put you off, your industry can actually ensure you pay next to nothing for some keywords. Using a nifty tool called “Advertising Research”, provided by the guys at SEMrush, we can see every keyword your competitor is targeting through AdWords. The tool will give you a long list of keywords (exactly how long depends on your subscription) where you can then see all the search volume, costs and the positions for each keyword, in realtime. By sorting in terms of CPC, you'll find various keywords, with traffic, which cost next to nothing. 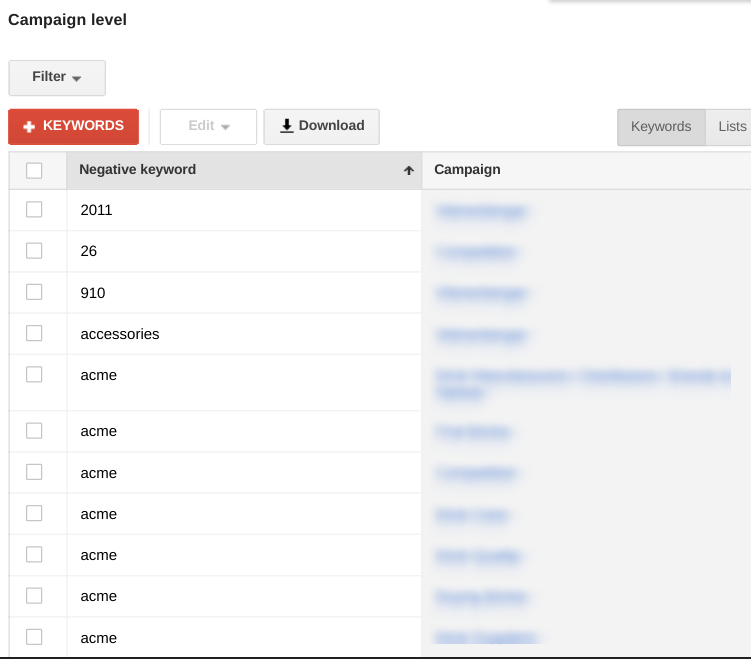 You can then use these keywords in your own AdWords Campaigns. However, don't fear, Costs Per Click (CPC) are merely an indication and are not the be-all and end-all. These figures provided by Google are not the definite costs and won't determine accurately how much your AdWords campaign is going to cost. Google has its own method of determining how much you’ll pay for each click, which is known as your “Quality Score”. The Quality Score ranges from 1-10, with 1 being the most desirable. However, in most cases, you’ll hover around the 6 mark, which is considered as average. Quality Score judges the relevancy of your advertisement against the keyword you want to show for. This means, for argument's sake, if you’ve got a landing page dedicated to van hire yet you're targeting “cars for sale”, you’re not going to get very far. But Google isn’t going to just reject your advertisement because, after all, this would stop money being spent at the end of the day. They’ll just charge you more to show your advertisement and it’s a big reason Google’s Revenue in Paid Clicks was up 31% year-on-year for 2015, contributing to $72 billion in global revenue. 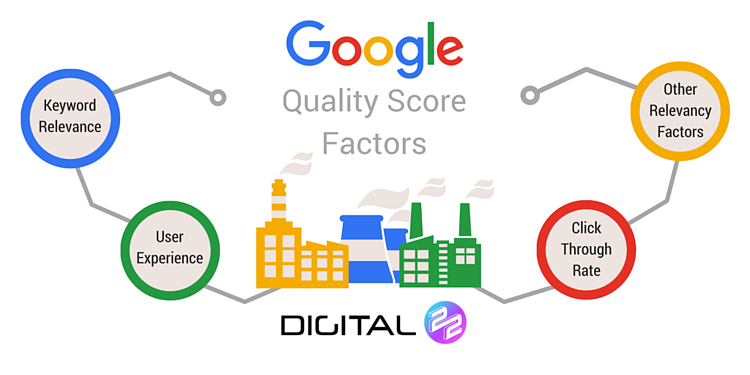 Quality Score is calculated by a host of external factors, but primarily by Google is judging your keyword relevancy and the user experience of your desired landing page. As your ads continue to be live, it will fluctuate as your click through rate and ad text changes. This highlights just how many moving parts there are when it comes to working out how much your AdWords campaign will cost. How does this affect what you pay? Google then takes your quality score and multiplies it by the maximum you’re willing to pay to give you your Ad Rank. Your Ad Rank is the position in which your Ad appears within the Search Engine Results Page. Quality Score (out of 10) x Maximum CPC = Ad Rank. You didn’t think I was going to leave you with no actionable take-aways did you? Here’s some ways you can limit your spend. One of the key features of AdWords is the idea around making sure you remove the keywords you don’t want to show for, otherwise known as Negative Keywords. Stopping your ads showing for things not related to your advertisement can stop unrelated clicks coming through, both minimising your cost and improving your click-through-rate. And this improves your quality score in the long run. Our blog on negative keywords can give you extra information. The is often overlooked but you can limit your campaigns so they only show to people in a certain geographical area. Reduce irrelevant clicks and drive more local conversions - what’s not to love about that? We’ve discussed who to prevent showing your ads to, but you can also choose when to show your ads. Using Campaigns with the All Features setting enabled (shown within the settings tab). You can then make a schedule best to suit you, whether it’s when you’re in the office to take calls, or when people have some leisure time to do some shopping - your ads, your choice! 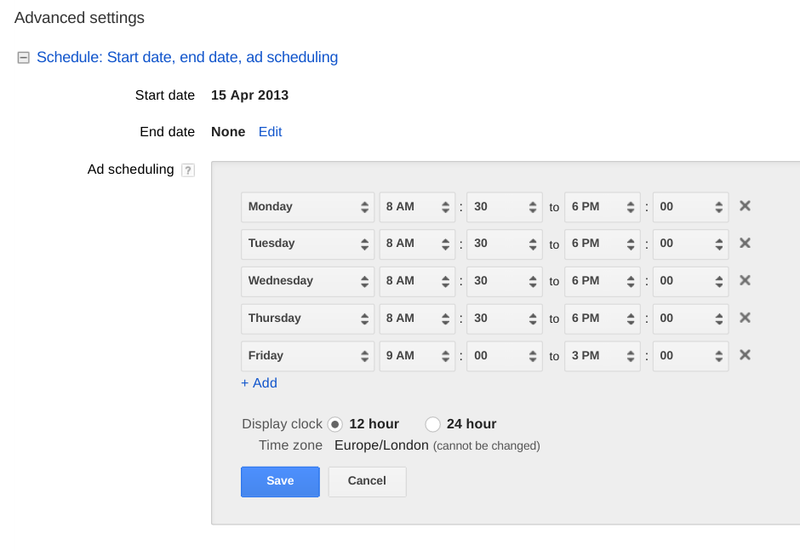 Ad Scheduling options in AdWords, located in the Advanced Settings. Truth be told, you’ll never be able to put an accurate cost of running an AdWords campaign because it’s a complex series of fine tunings and external factors. But if you’re short of time, you can cut corners and get a rough idea of how much you’re going to spend by using this PPC cost predictor. The highly competitive nature of PPC and AdWords means that the playing field is always changing. The best way to work out a cost before a campaign is to decide on your maximum budget, then try to get the best possible ROI through effective planning and execution. Want to save money on your PPC Campaigns?